Did you know that 500million people use Instagram Stories every day? Almost three years ago Instagram introduced us to a new feature; Instagram stories, the 24-hour disappearing snap designed to showcase people and brands in their day to day lives. 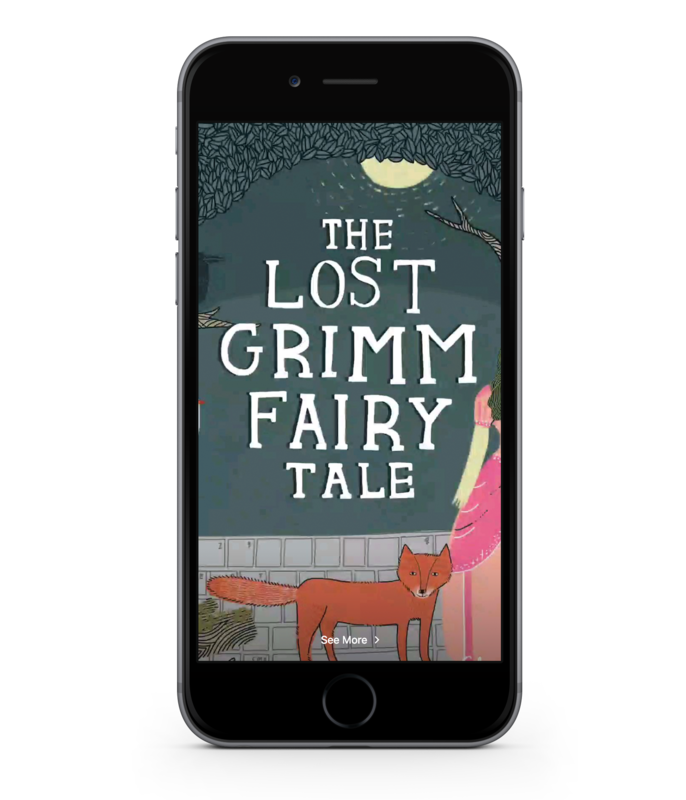 The feature’s blatant copy of competitor Snapchat’s story feature did not go unnoticed, but based on its significant growth, it hasn’t curbed their success. Fast forward to early 2019 and Instagram stories has become one of the most used features on any social media platform, with Snapchat’s stories trailing behind with 191 million daily users. This is good news for the millions of businesses and marketers as Instagram now has 58 times more engagement per follower than Facebook. By linking your Instagram business page to your Facebook Ads Manager you can enable strategic targeting with highly measurable results. Utilising Ads Manager can aid in aligning your social strategy objectives with those of your Facebook Pages, providing for a highly targeted, integrated approach. Combining this with Facebook Creative Hub, you can create and manage highly effective Stories Ads which translate into clicks, engagements, and website traffic for your company. Many brands have implemented Stories Ads to great effect. Let’s have a look at a number of these below. Goal: Drive Traffic to the website to entice a sale. British Airways London sought to drive traffic to their website in a creative way through visual story-telling. By giving scenes from locations around the world, the brand encouraged people to book a flight to a destination of choice.. 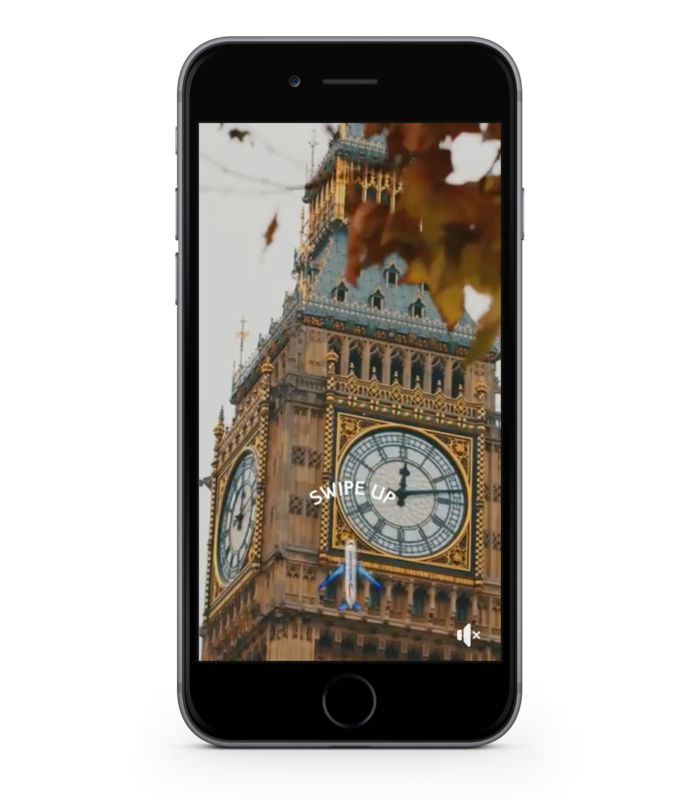 The brand utilized the features of the Facebook Creative shop to refresh the swipe up feature for Instagram. The inventive use of the plane emoji is playful and a visually appealing way of enticing people to swipe up, drawing people to the CTA at the bottom of the screen. Goal: Move people through the sales funnel & purchase. 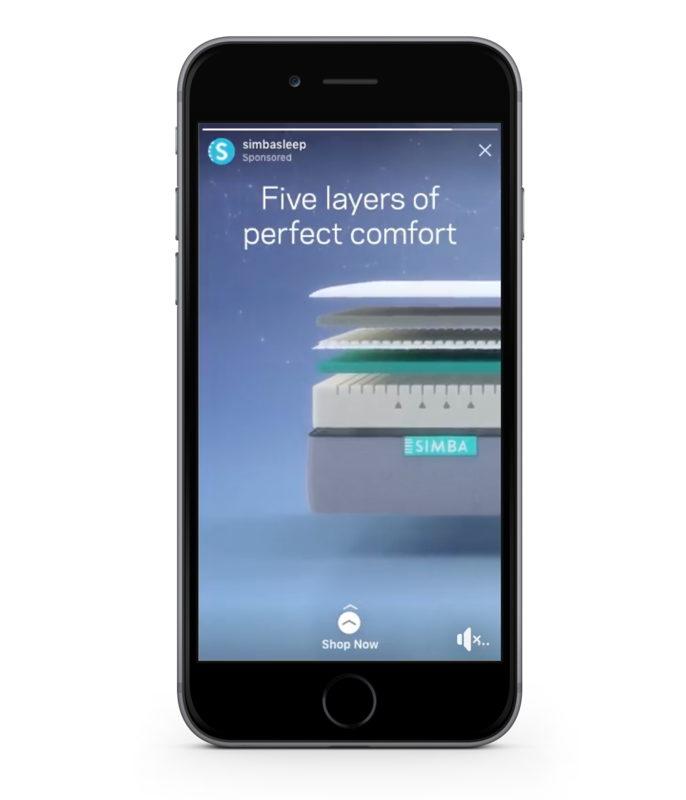 A bedding and mattress supplier, Simba provides short, informational product videos through Instagram stories. Usually, a high-risk purchase for individuals, the bite-size videos enable consumers to research online – purchase offline (ROPO) by engaging passive shoppers, increasing engagement and driving consumers further down the sales channel. Viewers build trust in a brand who is transparent about how their product works, as well as a clear price offering, not featured here. 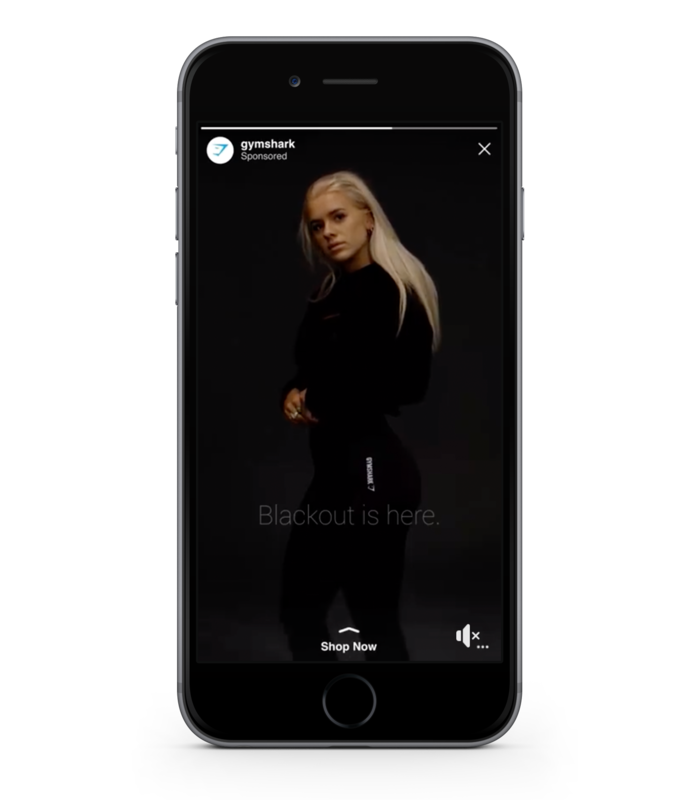 Throughout a Black Friday promotion, Gymshark created visually-striking, full-screen ads in Instagram Stories with short-form, vertical videos using clear branding and straightforward messaging, playing on the days namesake with their “BLACKOUT” promotion, to instantly get their point across. The company utilized user-generated content as well as their own to further involve customers in the campaign. Even without a specific product on offer, CTAs that inspire urgency give people the feeling that they could be miss out on something special. Running this campaign for two weeks, Gymshark’s campaign reached 16.4 million people with 40% of purchases made during the campaign coming from Instagram. 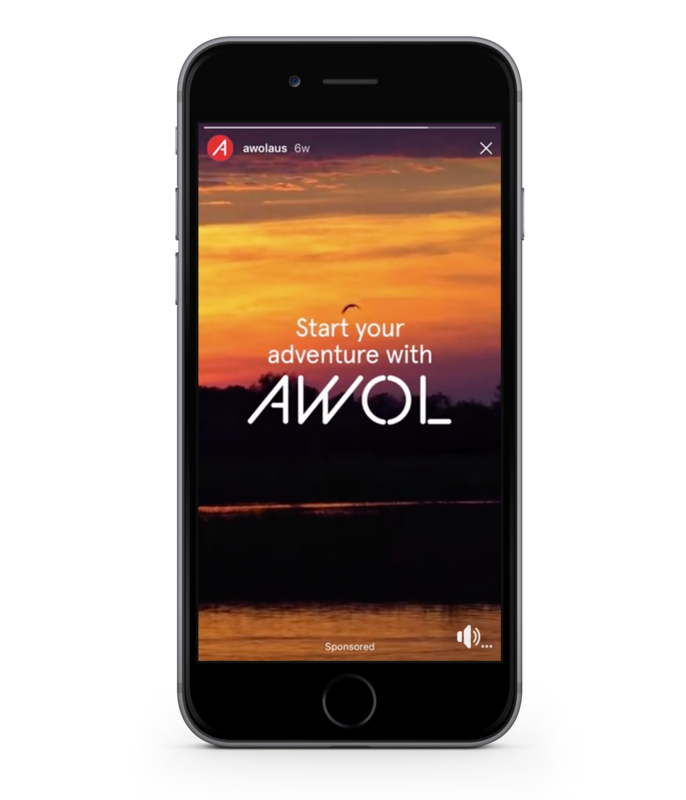 Under its Millenial brand AWOL, Qantas used adverts through Instagram Stories to showcase the ultimate global experiences using carousel videos. The engaging full-screen format is an ideal platform to connect with millennials, which Qantas achieved. With over 70% of millennials being influenced in their holiday purchase decision, Qantas utilized pop culture in the form of music who are highly influenced by pop culture and listen to more music than any other generation, the brand fully used Stories’ ample space to spotlight its campaign. Qantas had great success with the month-long campaign, resulting in a 3-point lift in brand awareness overall, and a 4-point lift in brand awareness among males aged 18–24. Among females aged 18–24, the campaign saw an uplift in ad recall by 4 points, with a 5-point lift among males aged 25–34. 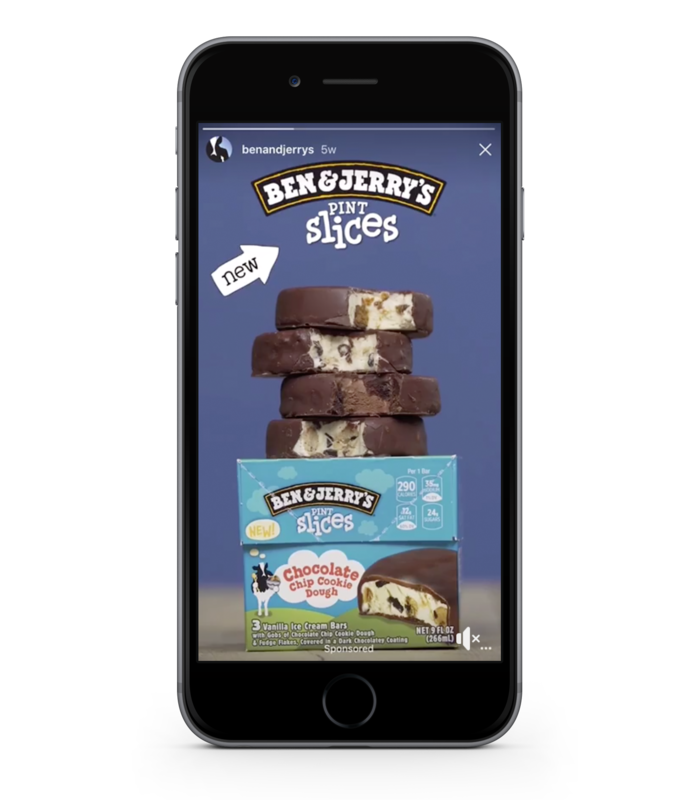 Through the implementation of clever visual effects, Ben & Jerry’s maximized their use of the vertical video sharing feature in launching a new product. The stories, still synonymous with the wider Ben and Jerry’s marketing efforts, highlighted the products single serving, portable packages. Through geotargeting their largest market (The US) through “Reach” Ad objectives, the ice cream manufacturer delivered their Stories campaign to a large Instagram audience. According to Instagram, Ben and Jerry’s Stories reached ice cream lovers across the country, drove up ad recall by 14 points, brand awareness by 6 points and created a 2 point spike in purchase intent for the new product. Goal: Add credibility to content to entice a “swipe up”. Blinkist summarises books for high performing individuals who lead busy lives. 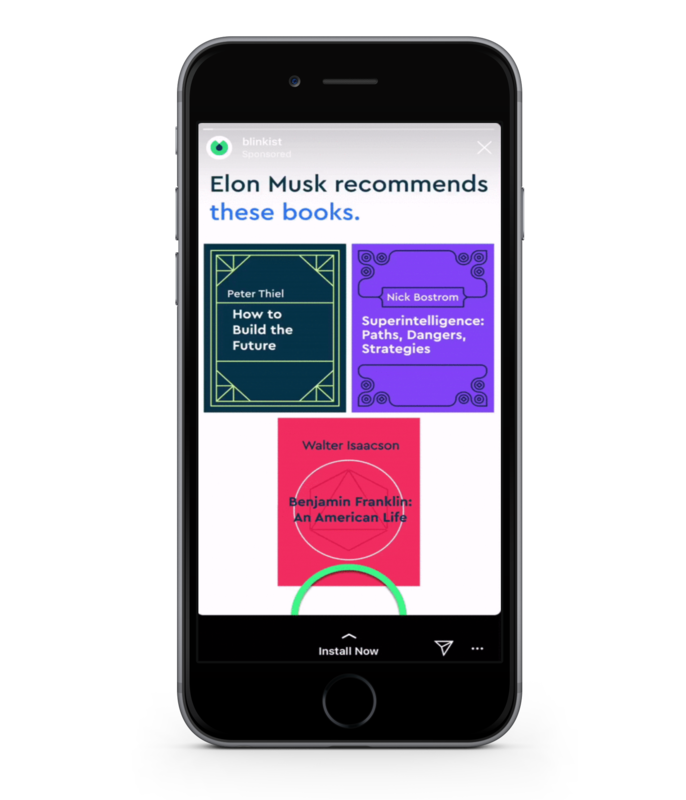 Through tagging entrepreneurial influencers, an example of which being Elon Musk, Blinkist adds credibility and authority to the book’s recommended within the Stories ad. Those who seek to emulate these key influencer’s success may be curious enough to swipe up and check out his reading list. Blinkist cleverly leads them there with green animation around the “swipe up” CTA. Calm, a mental wellness app, encourages regular meditation for higher quality sleep. Through the Stories feature, Calm posts Instagram “Sleep Stories” which are the adult equivalent of bedtime stories. There are tales from the lush sequoia forests of California, the Amazon forests of Brazil, to the planets and stardust outer space and so on. These give listeners a chance to power down their minds, so they can enter deep sleep. By continuously providing content that educates or enlightens followers, Calm offers concrete value through Stories content. This is a very welcome shift as compared to most brands & businesses, who push to promote products and services before the user is bought in or cares enough to engage, encouraging repeat visits and engagement to the profile. Airbnb’s Travel Tuesday series utilizes professional photographs and user-generated content in a bid to provide the community with Inspirational travel ideas by transforming each image into an interactive quiz. Viewers are asked to identify the location within the image through the use of Instagram’s polling and question features. 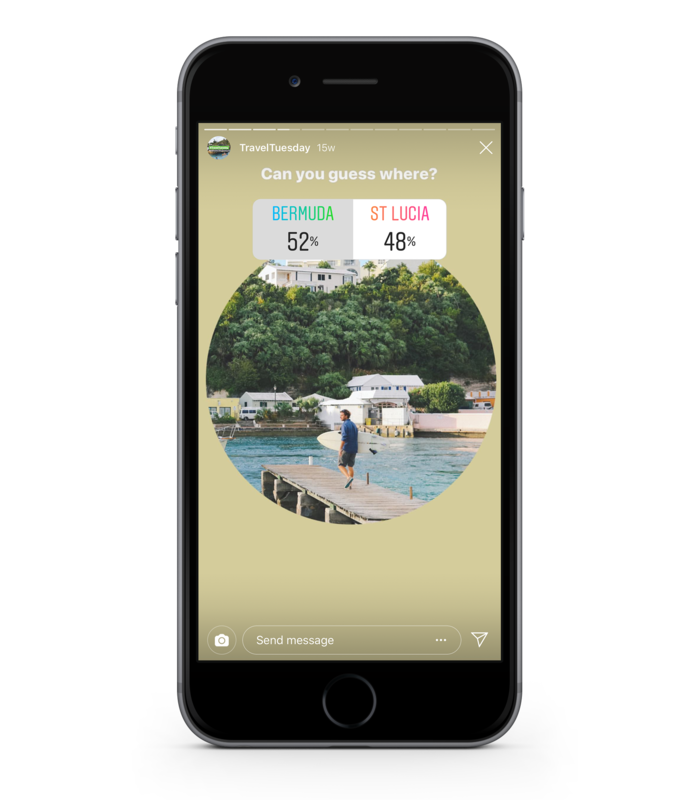 Once the location has been revealed and the user is engaged, Airbnb prompts viewers to “swipe up” to book accommodation in that location. As well as engaging users, this offers a measurable Return-of-Investment (ROI). With brands facing increasing pressure to determine social media’s ROI, having additional metrics, like Instagram traffic, is essential. Using more collaborate elements of Stories such as questions or polls, for example, can encourage engagement and direct conversation with your audience. By asking and answering questions, your brand will begin to build rapport with your users, facilitating trust. A conversation also opens the opportunity to gain customer insights, whether that be related to your brand, products or issues your customers face. Through their “Summer in the Bag” campaign, food delivery platform Deliveroo created Instagram Stories, heavily reliant on the Boomerang feature, to increase brand awareness and relevance throughout the summer months. With summer being considered a highly social period, it is easy to understand the route Deliveroo took below, insinuating the social aspect in using their product. While the content is of exceptional quality, the use of boomerangs, emojis and playful give Deliveroo authentic credibility, humanizing the brand as they end on the logo with a Call-to-Action in the form of a swipe up to the app. In our modern era of marketing, it often quite difficult to capture viewers, with many disengaging from content after as little as 3 seconds. Effective video content can combat this as it has the ability to hold our attention 5x longer than still images. As Facebook and Instagram’s algorithms favourite video, Instagram Stories ad campaign is one-way to overcome this. By placing your most engaging/valuable content first in your story sequence, viewers are more susceptible to watching your entire Story to the end, wherein you can ask for them to take an action at the end of it. Due to the high curation of the main feed by influencers and brands, a lot of messaging has become unauthentic to users. Instagram Stories bridge that gap, using stories to connect deeper with those already following you. They easy for marketers to engage with users, humanize their brands, create leads, and generate customers on the platform. The use of polls and stickers on stories aids this by reducing formality, giving a direct line of feedback and insights from customers. Questions such as “Would you pay more for a waterproof version?” along with a simple “Yes” or “No”. Or by simply asking if they like a specific aspect of the current product/service to gauge how valuable that feature is. Your Call to Action is the final push to drive people to your goal, so when creating Instagram Stories ensure it is clear and purposeful. If your brand’s objective is to reach the greatest number of people, adding a call-to-action at the bottom of your ad can still aid those interested in learning more. One of the simplest ways to do this on Instagram is to create a CTA story via the “swipe-up” feature on Instagram through free incentives or lead magnets, discussed in previous articles. Your social media should serve as a tool to generate business results. Instagram, especially in light of recent updates, is the perfect platform to capitalise on with 72% of Instagram users say they have purchased a product they saw on the app. So how are you taking people off of Instagram and onto your website or prospect list? Engagement is great, but unless it grows your leads (and sales! ), it’s not worth your time. Text placement is often an overlooked, yet important consideration with Instagram Stories. Your viewer’s eye will naturally be drawn to the centre of the screen, so capitalize on this by placing your most important information here where applicable. If you must include text in the top or bottom portion of the graphic, consider it’s placement carefully. For example, if you are engaging the “swipe up” feature, include text only on the top half of your Instagram Stories Ads – avoiding visual conflict with the swipe up call-to-action at the bottom. Carousel ads in Instagram Stories allow advertisers to reach target audiences with more than one single piece of content. By sharing an integrated story, which can be made up of three images or three 15-second videos, Carousels let you tell a more “sequenced” story over several parts. While using Carousel Ads stay on your viewer’s screen longer, they can still tap through Carousels, so ensuring content can successfully engage viewers is still vital. Sheryl Sandberg, chief operations officer at Facebook, previously revealed that 60% of Instagram Stories ads were viewed with the sound on! Having audio, whether it’s a voice over or music can make your Instagram Stories ad more engaging and draw your audience in. Instagram recently made this easier with the addition of a music sticker within Stories, letting brand and personal pages overlay soundtracks onto content. As seen with AWOL example above, the use of music in advertising is highly influential on an emotional level. 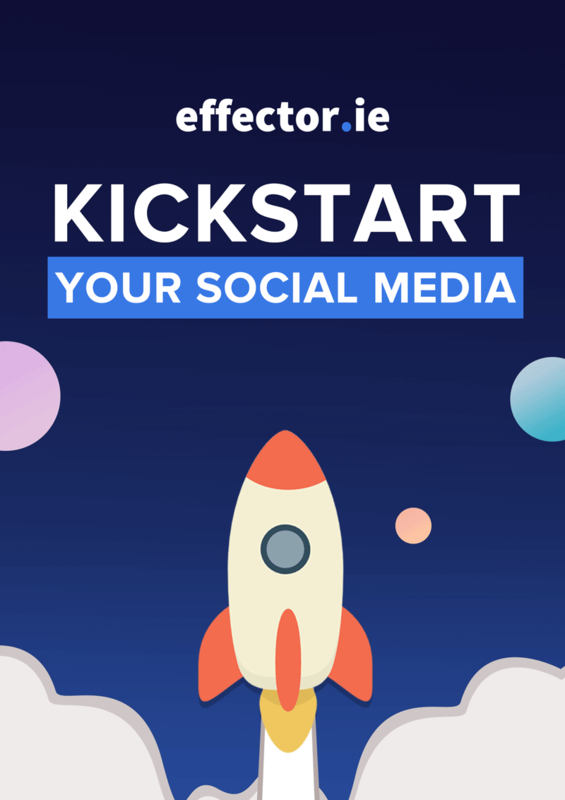 Instagram stories are a fantastic way to connect and engage with your audience. It has become a fun, natural, and unfiltered way to share with your audience. So show what makes your brand fun and relatable. Implement the features with Stories to effectively engage your audience and make it easier for people to relate to your audience on the social platform. By utilizing Instagram Stories you can drive goal conversions through the platform with clear results.